So I haven’t blogged in ages but then something made me want to. It’s about flags and it’s about people. It’s about people’s relationship to flags. Little rectangular pieces of cloth. People seem awfully attached to them. Currently, in Belfast, a small number of people are very upset that they can’t see their flag over City Hall anymore, except for really important days like Catherine Middleton’s birthday. If you like flags, you can read a bit more about the situation here. But you probably shouldn’t bother because it’s not that interesting. What is interesting is that that people are throwing bricks, burning cars, attacking people and shooting at police. They really are quite upset. People are most upset in the less well off areas. There are lots of areas in Belfast that aren’t particularly well off. Historically, many of the people there get more upset about flags than about less important things, like the structural reasons why they don’t have jobs or money or opportunities. But this isn’t just about Belfast. It’s about flags and it’s about people. Lots of people who aren’t very well off love flags. They paint them on their walls and put them all over their bodies. It’s no surprise that these people are so attached to flags. Low quality housing, unemployment, low levels of education, a lack of opportunity – the flag has clearly been very good to them. They display admirable loyalty to a flag that has provided them with the opportunity to live without basic services and limited possibility of social progression. In fact, there tends to be a direct correlation between lack of opportunity and love of flag. The people who love flags the most are the ones who have received the least from them. I’m yet to meet a barrister or a banker who would take to the streets in violent protest in defence of a flag. This is perhaps strange because the flag often violently defends them. 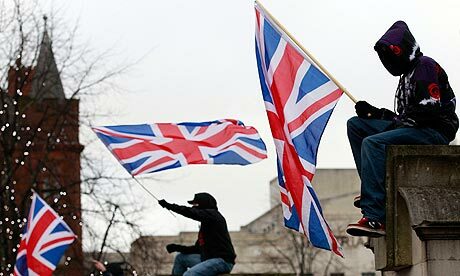 Many people from working class areas love flags so much that they are often willing to fight for them. Every army across the world is full of working class people fighting for flags. 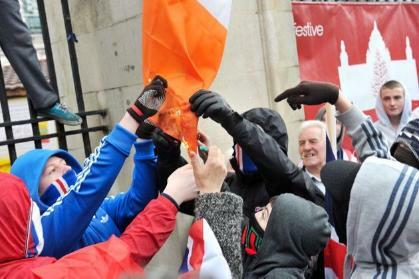 For 30 years in Northern Ireland working class people from Belfast and Derry fought working class people from Newcastle and Leeds in a dispute over which flag was best. That none of them had benefited very much from either flag involved was never really an issue. They fought relentlessly over their flags. They flew them proudly off their crumbling houses and waved them joyfully from the top of their flat complexes, which was difficult because the lifts were often broken and there was glass and needles on the stairs. Not many barristers or bankers took part in the conflict. They don’t like flags as much. They have money and jobs and prospects. What could a flag offer them? Absolutely spot on. It’s a damned tragedy.